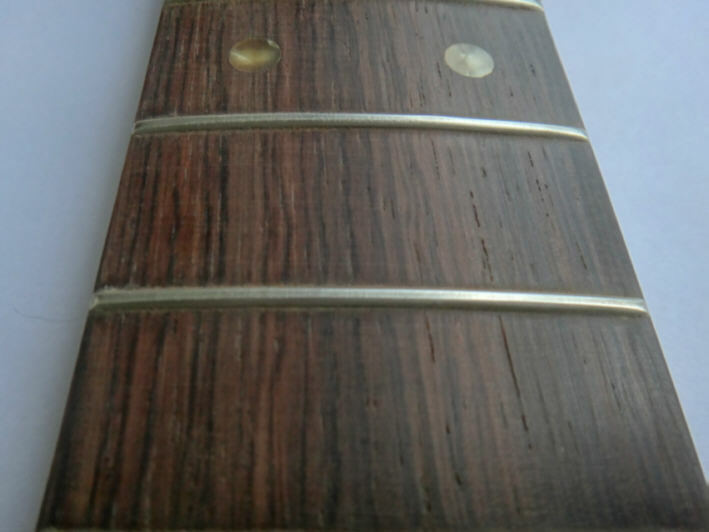 Brazilian Rosewood and Guitars - how to detect, what to do? This page is dedicated to the topic Brazilian rosewood or Dalbergia nigra or Jacaranda ( different names for one and the same wood) its use on musical instruments and the resulting problems. Dalbergia nigra, commonly known as the Bahia Rosewood, Jacarandá da Bahia, Brazilian Rosewood, Rio Rosewood, Jacarandá De Brasil, Pianowood, Caviuna, or Obuina, is a species of legume in the Fabaceae family. It is found only in Brazil, from the eastern forests of Bahia to Rio de Janeiro. It is threatened by habitat loss, since most of its habitat has been converted to farmland. Due to its endangered status, it was CITES-listed on Nov. 6 1992 in Appendix I (the most protected), and illegal to trade. And this has now become the problem of many owners of musical instruments. Most commonly affected are guitar fingerboards of instruments that were manufactured before 1966 , especially guitars and basses made by the companies Fender and Gibson ( according to conservative estimates, at least 30,000 instruments alone will likely be affected in Germany ) . Only through a letter to the editor in the magazine Guitar & Bass in 2011 this issue was publicized in musical circles . This sparked a discussion in various media and forums and by the end of 2012 resulted in the seizure of several instruments with and without Brazilian rosewood and the cancellation of the german Vintage Guitar Show in Oldenburg, taking place since 1985 . By 2011, neither musicians nor luthiers, dealers or musicians press had known of this marketing ban in force since 1992 . After the announcement of this many musicians initially thought only instruments that were built after 1992 would be affected . But then it turned out that all instruments that were fitted with Brazilian rosewood and made after 1947 without the appropriate certificate may not be used commercially . All instruments built before 1947 are considered antique and are not affected. Marketing in this case means the offer, sale or exhibition (with entrance fee ). At first also public playing of such an instrument against gage was also classified as marketing. This even led to seizures of individual instruments at a concert. The authorities had certainly known of the marketing ban, but missed almost 20 years to make this problem known in musical circles. They knew well from the use of this wood in furniture-making but they didn´t know, that Brazilian rosewood was a common wood for guitar fingerboards and partly also for bodies of acoustic guitar until the end of the 60s. By the scandal of illegally harvested and imported tropical timber in 2011 in which the Gibson and the now defunct german company Nagel in Hamburg were involved , the german authorities learned from the use of tropical woods on guitars , and then noticed that also the inbetween prohibited Brazilian rosewood was partly used. After the initial , very restrictive approach by the authorities with numerous checks and searches of collectors, dealers and luthiers they have now realized that not every guitarist playing an old Strat with rosewood fingerboard is a criminal or at least an offenders and the Federal Agency for Nature Conservation gave the recommendation that executiv bodies should no longer constitutesa concert on such an instrument as marketing but as a cultural performance. The text of the EU-wide regulation is available as a pdf here. Even if the wording in all EU countries is the same, the implementation from country to country and even from state to state in Germany is handled differently . To date, the majority of European countries except Germany do not care about the theme Brazilian rosewood on guitars. It is often heard that it is anyway almost 100% of instruments from the period before 1992 , so there is no need for immediate action and accordingly vintage trade shows in other EU countries take place without restrictions and controls. Meanwhile, discussions were held at the EU level and trying to seek a uniform approach , even a globally applicable instruments-pass is under discussion. So much for the history of this problem. Whoever owns such an instrument may be unknowingly become an offender if he trys to sell it or if he tries to take such an instrument over a border outside the EU without being in possession of the CITES documents. Similarly, an import from a country outside the EU without proper papers since 1992 is no longer allowed. An import example from the United States, according to protection of species determination is only allowed with appropriate CITES export and import documents, which need to be obtained prior to import, and then only for private purposes without any commercial intent. The mere possession is not punishable , but if you want to sell or exhibit the guitar in Germany you don`t get around to get an appropriate CITES certificate for commercial use . What conditions must be met in order to reach such a document ? 1. The instrument must have been made before 20.7.1992 . As evidence the opinion of an expert is required. A list of officially recognized experts will soon be published by the BfN . Most authorities also except reports from experienced dealers , luthiers or even private collectors with proven years of experience. 2. The instrument must actually contain parts of Brazilian rosewood . That would result from standing above report, or in doubt, a demonstration in the Wood Biological Institute in Hamburgwould be necessary. 3. The instrument must be shown to have acted within the EU before 20.7.1992 .... and this is the crux ! I For example: the instrument was bought 10 years ago by a private citizen and the owner is probably untraceable or even died , how can I demonstrate this ? Since the authorities have recognized this problem inbetween in most states no longer provide clear evidence of a purchase prior to 1992 is required . There is for example the opportunity to have this confirmed by a witness in a written statement to the owner, some authorities suffice even the testimony of the owner himself. Depending on the state where you live you have to apply to the competent authority and apply the CITES document . The processing time is usually about 3 weeks , the fees vary considerably. A list of competent authorities is available here. Does my guitar have Brazilian Rosewood on it? Many guitarists do not know certainly that they play an instrument with Brazilian rosewood fingerboard. 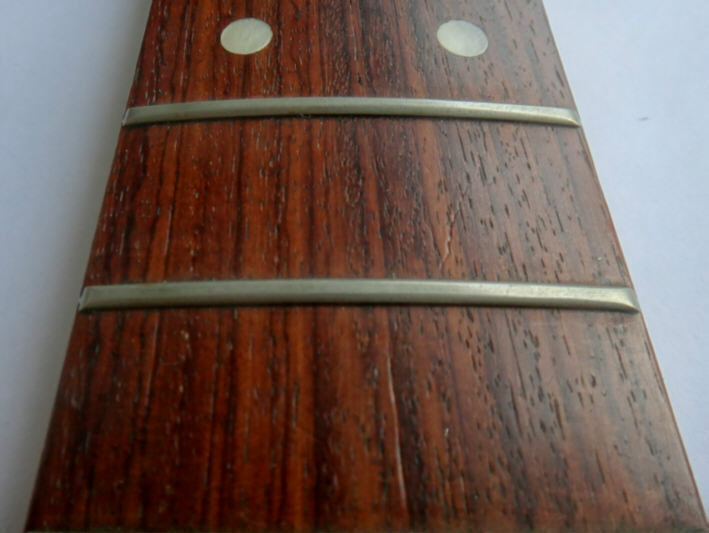 Brazilian rosewood was a common wood for fingerboards and partly also for bodies and bridges of high quality instruments, produced especially in the U.S. until about 1965 (Fender,Gibson) sometimes until 1969 (Martin) . Even then, the wood was scarce and therefore expensive , so almost all manufacturers evaded on East Indian rosewood , which came from India and inbetween mainly from Indonesia or Honduras. Since 1968 in Brazil there is an export ban on Brazilian rosewood and according to previous findings after 1968 only wood from old stock has been processed. Unfortunately, many manufacturers and luthiers missed it , have this confirmed these old stocks prior to 1992. After that it became increasingly difficult to provide proof of the old stock , because the corresponding papers (eg purchase invoices ) were often not traceable anymore. The manufacturers who have built instruments with Brazilian rosewood after 1992 , should have absolutely every instrument enclose a CITES permit . If they have not done it and can no longer make up for these instruments (as. eg Gibson and PRS have already announced ) they are not certifiable , what means they may no longer be traded or issued . The mere possession is not an offense, only a passing to the inherits or a donation to government agencies is possible. Almost all Fender and Gibson instruments until 1965 are equipped with Brazilian rosewood fretboards, unless they have one-piece maple necks (Fender until mid-1959 ) or were equipped with fingerboard and bridge of ebony , such as the Gibson Les Paul Custom or Super 400. In the ' transition years ' 1966-1968 Brazlian rosewood is rare, but it still appears occasionally. Many other U.S. manufacturers , for example Rickenbacker ,Gretsch ,Danelectro and Guild have processed until the early 60s with Brazilian rosewood, Martin has been processed to approximately 1969 with old stocks from Brazilian rosewood . German and other European manufacturers have generally processed only on higher-value instruments and also to the early 60s with Brazilian rosewood . In Japan and other far east guitars we have not been able to detect Brazlian rosewood . For a macroscopic ( by eye or with a magnifying glass ) analysis of the fretboard you should really consider a cut and look at the front surface. 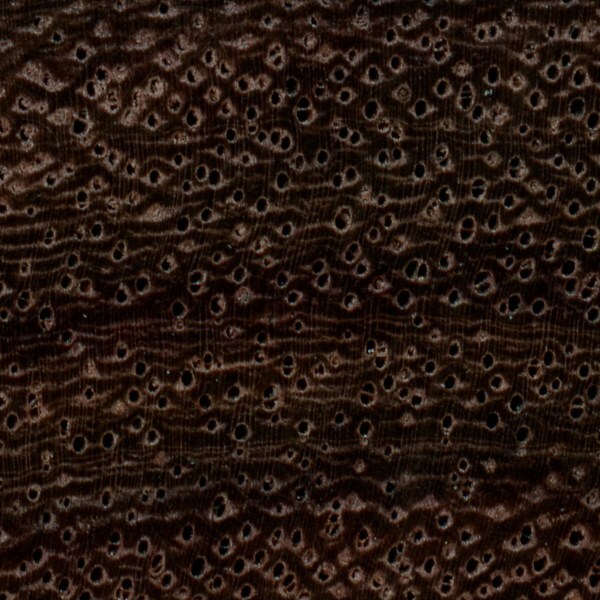 Then you would find in Indian rosewood about 2-3 times as many pores on the same area as on Brazilian rosewood. This is of course not possible without destroying the instrument. In some unpainted and not enclosed fingerboards you can possibly have a look at the end of the fretboard. A 10x magnifying loupe does provide good results . Since this is not possible with many fingerboards, we are left with a view from above. Here one can also find significant differences. However, if you have no basis for comparison or lack of experience there is a great risk of confusion ( see below). Another feature of Brazilian rosewood is its odor : When grinding or rubbing with the finger a sweet odor can be determined that smells a bit like vanilla, cinnamon or rose fragrance (hence the term : ' Rosewood ' ) . Other rosewoods show significantly less odor. 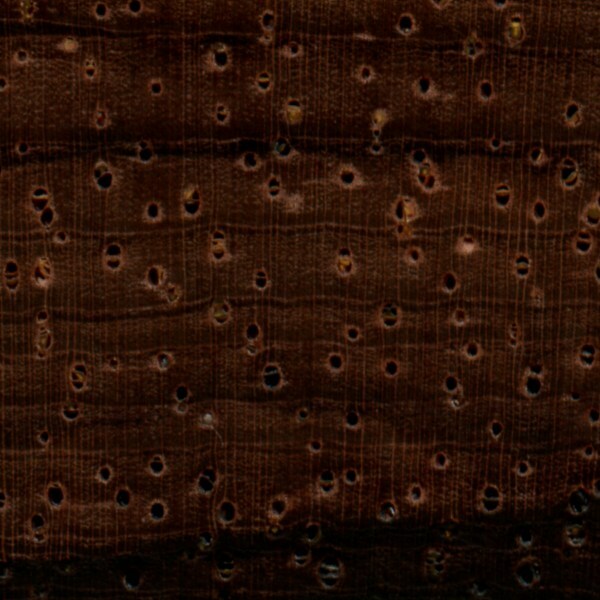 The first two pictures are from the web page below whre you can also find an exact description and other identifying features: http://www.wood-database.com/lumber-identification/hardwoods/brazilian-rosewood/ Everything said above of course concerns not only musical instruments but also any other type of objects with Brazilian rosewood and the wood itself even in very small quantities. Fingerboard made of Indian rosewood with the more reddish, sometimes slightly purple color with very many and very small pores.